An old, damaged or malfunctioning steering system is a recipe for disaster. Steering malfunction can go from being a mild annoyance to becoming a serious danger, so the moment you suspect there may be something wrong with your steering, North Avenue Automotive strongly recommends you schedule an inspection. After inspecting your vehicle thoroughly, our experienced mechanics will be able to tell you exactly where the problems lay as well as what can be done to repair your steering and get you back on the road in a safe manner. Your vehicle’s steering and suspension go hand in hand. 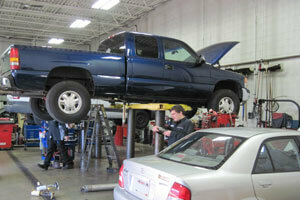 If you have a suspension problem, chances are your steering will be affected in time. If you are having difficulty controlling your car, negotiating curves or if you feel like your vehicle is pulling to the right or left even though you are driving straight, chances are your steering needs to be adjusted or repaired. Wheel alignment is also a common steering problem, as is uneven tire and one that can be remedied quite easily. In short, there are many factors affecting your vehicle’s steering, and if you are in or around Milwaukee, North Avenue Automotive can quickly and efficiently diagnose the problem and offer steering repair services. The longer you wait to take your car in to a qualified auto and body shop, the more damage a faulty steering will inflict on other components of your car. The trick to getting the problem fixed before it turns into extensive and costly repair work is to keep regular maintenance appointments and visit North Avenue Automotive as soon as you notice a problem. Being able to confidently and safely steer your vehicle is just as important as your ability to brake and stop. Driving around with a faulty or jerky steering is not only annoying, it is extremely dangerous and irresponsible. If you find yourself constantly overcompensating while driving to counterbalance the effects of a defective steering, it is more than time to schedule a steering inspection. If you are in Milwaukee, North Avenue Automotive will gladly inspect your vehicle and offer you a free estimate on any steering repair service you may need.